In order to help UNT students dress for success for internship and job interviews, the Career Center held its spring 2019 Suit Up on Feb. 5. The event enabled 990 students to select and keep a total of 2,341 professional and business casual clothing and accessory items from donations made by UNT faculty and staff and employers/businesses. For the students, the event was a great opportunity to obtain professional clothing that will assist them with their achieving their future goals. “It is very giving of UNT to provide professional clothes for students, and what I was able to get from Suit Up will be perfect for my job interviews,” said student Tristan Barcia. “Suit Up was perfect because as college students it’s hard to make the financial investment in professional clothes,” noted student LeeAnn Abdul-Jabar. 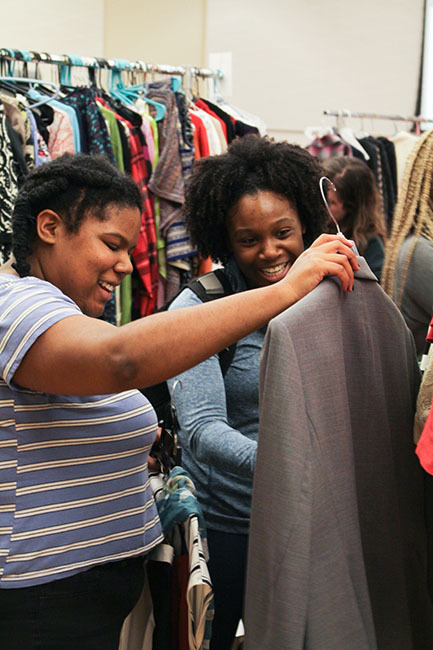 “Suit Up offered a great variety of professional clothes, which is useful because college students need to be career ready at all times,” said student Maya Joseph. The event also was featured on NBC 5 News, and the segment can be viewed here. Thanks to funding from the UNT Diamond Eagles Giving Society, Suit Up, as part of the Students of Need: Suit Up, Fuel Up, Cap Up initiative, will have a permanent location in Crumley Hall, with dedicated fitting rooms and the ability to loan professional clothing year-round. Planning for the new space is currently underway, with the goal of implementation in the fall. For more information on the Career Center and its programs, visit http://studentaffairs.unt.edu/career-center.